Being Frugal and Making It Work: Greenies ~ The Mouth-Wowing Dog Treat Your Pooch Will Love! Greenies ~ The Mouth-Wowing Dog Treat Your Pooch Will Love! Looking to give your barking pal a treat that they will love and that will also clean their teeth and freshen their breath? I have the answer... Greenies! I am fortunate enough to be a Chewy Influencer and in exchange for my honest reviews, my two spoiled pups get special food and treats, delivered right to our door, every month! Zena (English Mastiff) and Thor (Great Dane/Mastiff) are lucky dogs, I would even go as far as saying that they are very spoiled too! When they see the blue Chewy.com box being delivered, it's almost like they know it's for them! This month Thor and Zena got a box of Greenies! 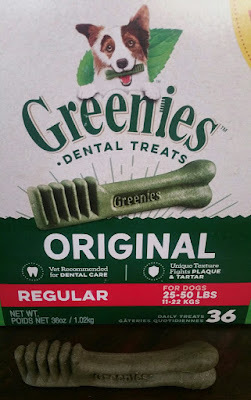 Greenies Dental Dog Treats are sure to keep your dog happy. Our dogs love the taste and I love that they help keep their breath fresh and their teeth clean. Greenies dog treats are an all-natural treat that keeps on giving! Zena and Thor love Greenies dog treats and give them 2 paws up! 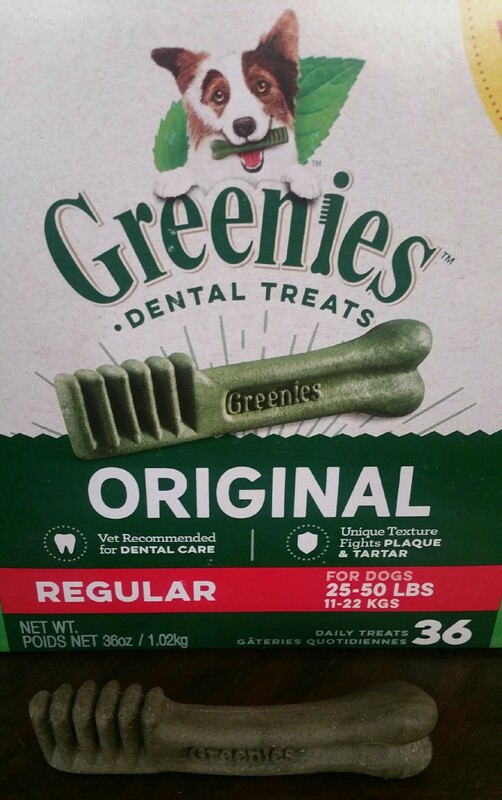 Give your pal the mouth-wowing treat that boosts dental health with Greenies Regular Dental Dog Treats! Made with all-natural ingredients, these uniquely-shaped snacks are designed to control and remove disease-causing plaque and tartar, all while putting an end to dreaded doggie breath. Each tasty chew features added vitamins and minerals, and is formulated to provide complete and balanced nutrition for adult dogs. Keep the cuddles coming and give your best friend the dental health he deserves with these veterinarian-recommended dental treats. I also love the fact that Greenies come in a variety of sizes for dogs big and small! They come in Petite, Teenie, Regular and Large! Even though our dogs are large breed, we give them the regular size. They are the perfect treat: not too big and not too small!